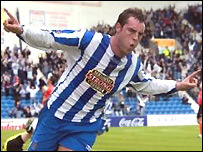 Kilmarnock forward Kris Boyd has turned down the offer of a three-year contract at Cardiff City. A £300,000 fee had been agreed for the 22-year-old, who is out of contract at Rugby Park in the summer. The player passed a medical and discussed personal terms in Wales but has now decided against the move. Killie general manager David Mackinnon said: "Kris has advised us that he will not be moving to Cardiff. We will discuss his future with him tomorrow." And Derek Riordan looks set to reject the chance of talks with Cardiff after Hibs gave the Championship club permission to approach their striker. Riordan's agent Jim McArthur said: "I don't know when we'll speak to them. We might not even speak to them. "I would say that's 50/50 at the moment because he's not really got to go anywhere, or will be pressured to leave." Meanwhile, Bluebirds assistant Terry Burton said Chris Baker should recover from an injury to face Wolves at home in the Championship on Saturday. Baker hobbled off before half-time of Cardiff's Carling Cup win over Colchester on Wednesday. But Burton said: "He's normally a quick healer so we'll keep our fingers crossed."